While the rest of us were taking in the view from our rooms at the inn, and drinking two-year-old, complimentary wine (ok, not everything was perfect), Snowball and her uncle went out in search of Dramamine to smooth out the squiggly seaside roads we knew were still waiting for us. I’m one of those obnoxious people that isn’t bothered by motion sickness so I started calling it Drama Mine. You will never convince me that isn’t where the name really came from. While out, they also had a philosophical discussion about just how this trip should be managed. Snowball is one of those personalities that tries to make everyone happy. Her uncle convinced her that was gonna be impossible on this trip. He suggested she consider the prime purpose of this vacation is her own photography expedition. The rest of the group should just sit back and enjoy the beauty of the country during the trip. Yeah, like that was gonna work. The next morning, with Snowball in the driver’s seat, her mom well sedated, er… um…, I mean medicated, and the coed now the official, full-time navigator, we continue our journey north along the Pacific Coast Highway. I take a glance at the map and even I can tell we still have a long way to go. I figure once we join back up with 101 it should get better. That wasn’t entirely true. We had the same squiggly roads all of the way, just with fewer views of the ocean. To pass the time along the way we had a discussion whether “Squiggly” was an actual word and how many Scrabble points you could get for it. One thing we started doing different was taking advantage of ‘Vista Points’ whenever we saw one. This gave us more chances to pile out of the van and walk around while Snowball and her uncle took pictures. The bucket list item of ‘Seeing Big Redwoods’ was fulfilled several times over. These stops were also a good opportunity for Snowball and me to switch off driving. During this leg we also made a side trip to the obligatory “Tree You Can Drive Through.” While waiting in line for this ‘once-in-a-lifetime experience’ we followed a car I swear was smaller than a Mini Cooper. We started calling it the Clown Car because it looked like quite a big family inside. We watched as they slowly approached the tree with seeming trepidation. Then it stopped – a quarter dozen camera-laden asians got out and started taking pictures of every foot of the journey of this little car through this big tree. Coupon from the Drive Thru Tree gift shop. No one in our group wanted similar pictures bad enough to face the risk of wedging the rented Dodge Caravan in the tree so we took the right turn out of the line. We did stop at the gift shop for an extended bathroom break and walk around. And of course we had to get a picture of our group standing in the tree. The final leg has very few stops and nowhere that looks like it has a clean restroom. I’m tired from driving as fast as I can on the curves while still keeping the van shiny side up. Highway 101 eventually leads us into Crescent City, the Gateway to the Redwoods. We pull into the motel with full bladders and empty patience. The lucky ones rush into the single restroom off the lobby while others get us registered. Confusion over working keycards puts frustration for the rest of us over the top as no one can get in the rooms while standing cross-legged in the hall. Technical difficulties eventually resolve themselves into long needed bathroom breaks. Afterwards, Snowball and I go around town for a reconnaissance. 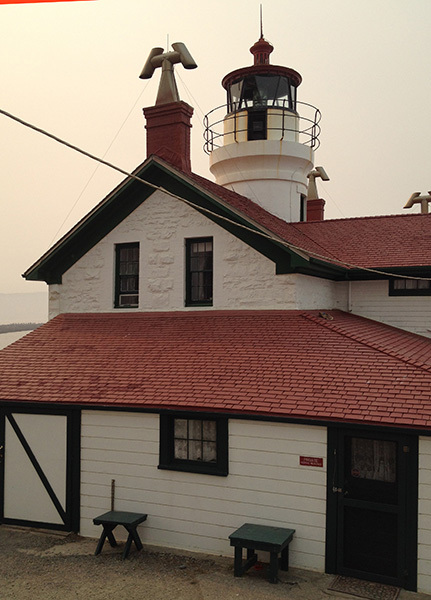 The guidebook for the area told of a light house tour. Hours were dependent on the tides which at first us flatlanders didn’t understand. When we saw the lighthouse we figured it out. You walk there from the shore and it is only accessible at low tide. Aw, life by the ocean. A little more exploring and we return to herd our group to dinner at the restaurant next to the motel. Seafood is on the menu of course. Several of us order calamari patties and uncle orders scallops. Those of us with calamari love it. The scallops seem to be made of the wrong fish for uncle’s taste. View of the light house from shore. The area in the foreground is under five feet of water at high tide. A sailor forever standing at the stormy wheel. Notice the detail of the crow’s nest and furled sails. A view of the town from a place to watch the ocean. A collection of buoys hanging from a tree. A view of Crescent City from the light house. Coed standing barefoot in the ocean. Early the next morning, Snowball and uncle go out to get sunrise pictures. Uncle also wants to find out whose dogs he heard barking all night. That mystery was solved when they found a jetty full of noisy seals. After exploring an especially picturesque beach they return. Together we all have an awesome breakfast and then go to explore the light house island. Some of the many light house and local beach pictures can be seen in the slideshow above. Next we split up, some go shopping, some go to stand barefoot in the ocean. I walk into the cold, advancing tide with my eyes in a camera viewfinder forgetting to take off my soon-saltwater-soaked shoes. That evening another seafood dinner and hope for a good night’s sleep. Tomorrow we head south to Yosemite. Go to my store. Buy a shirt. Enter coupon code FAVSHIRT and get 15% off the price. Offer ends September 1.